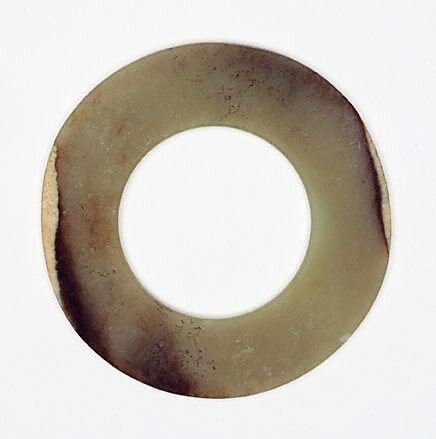 'Bi', a disc with a central perforation, and 'cong', a roughly square cross-section with a circular bore, are two of the most familiar jade ritual objects of ancient China. The number of 'bi' and 'cong' discovered throughout late Neolithic and Bronze Age tombs and burial sites is testimony to their significance in ancient rituals and ceremonies, although their meaning and function remain uncertain. As Western Zhou ritual texts refer to 'bi' and 'cong' as offerings to heaven and earth respectively, they have become symbols of heaven and earth. They were usually found together in tombs. The gallery's example of a 'bi' is a rich, opaque green. The term 'bi' has been applied to discs with small central holes. If the hole is larger in proportion to the whole area of the disc, then the jade is generally known as a 'huang' in Chinese. Like the 'bi' disc, the 'huang' ring is also a major type of ancient ritual jade, existing in China as early as the 5th millennium BCE. Two types were popular; the plain ring and the ring with a central vertical collar. The gallery's 'huang' ring (Acc.no. 289.1996) is a rich, opaque, creamy green with milkish and brown patches or veins. The Asian Collections Art Gallery of New South Wales , 'Bronzes and Jades', Sydney, 2003, 73 (colour illus. ).